Charming, crafty, and comical, yellow-collared macaws offer all the personality of a large macaw in a smaller, more affordable, and easier to care for package. They are extremely intelligent, which makes training easy, and most birds learn to talk quite well. These parrots love attention and enjoy being part of a family, so they make great pets. This is true even if you haven't kept a parrot before as long as you have the time to dedicate to a little, lovable clown. Yellow-collared macaws are native to central South America. Their range includes parts of Bolivia as well as northern Paraguay and Argentina. They can also be found in southwest Brazil along with a small area in the center part of that country. In the wild, yellow-collared macaws form tight bonds with their mate and are rarely apart, even when in a flock. They nest in tree cavities within tropical forests and low woodlands. As with other parrot species, these birds are threatened and are verging on endangered. The taxonomy of this species is interesting. 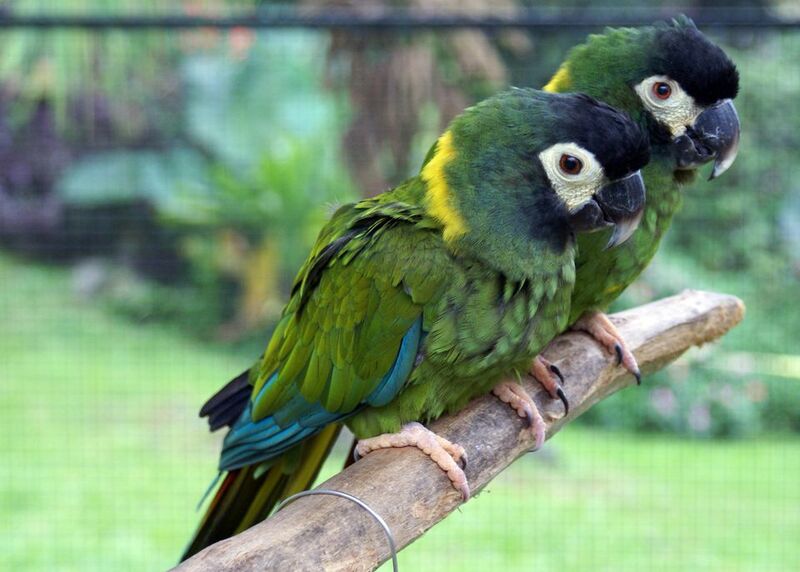 Sometimes they are classified in the genus of a small Ara parrot along with severe macaws. Other classifications place them in the Primolius genus with other mini macaws like the Illiger's macaw, one of the yellow-collared's closest relations. To make it even more confusing, the yellow-collared formerly had the scientific name of Propyrrhura auricollis. The yellow-collared macaw is one of the largest mini macaws and reaches a length of about 15 to 17 inches from the beak to the end of the tail. Adults typically weigh between 8 and 10 ounces. When cared for properly, captive yellow-collared macaws can live upwards of 50 years. Affectionate, but somewhat mischievous, the yellow-collared macaw has a reputation for being an intelligent and resourceful little parrot. They thrive on attention from their owners and will seek that attention by any means necessary. Expect a greeting when you get home and lots of love and affection whether you want it or not. Although some are one-person birds, most yellow-collared macaws make extraordinary family pets. It really helps when a bird is socialized young, though they are generally friendly by nature. These traits are extensions from their pairing and flocking instincts, which they will gladly extend to their human flock. Yellow-collared macaws have primarily green bodies in various shades. The green can be a little darker than some parrots, though there are shades of olive and even some lime greens in many birds. They get their common name from striking yellow bands around the back of their necks (also called the nape). The birds' long maroon tails have a bright blue hue on the tips. When in flight, you'll also notice yellow under the wings. The forehead on this bird is a bluish-black color, which is a stark contrast to the large white eye patches that surround an orange iris. The beaks are mostly black, fading into a white point at the end of the upper mandible, and their feet are flesh-colored. The males and females look alike because this is a monomorphic species of bird. DNA sexing or a surgical procedure are the only way to tell them apart. Also, don't be swayed by the somewhat lackluster color of a young bird because the colors will become more vivid with age. Yellow-collared macaws, like many other mini macaw species, have a reputation for attaching themselves to the person who cares for them most. They crave attention and interaction and, because of this, they're not a good choice if you don't have several hours a day to devote them. While yellow-collared macaws are generally not as noisy as larger macaws, they are more than capable of being quite loud when the mood strikes. Some people even compare their call to a gull. This means they may not make the best apartment or condominium pet. Many yellow-collareds are gifted talkers, though. They are capable of saying several words and phrases. Some owners have noted that the yellow-collared macaw is able to speak with more clarity than larger species. Even so, no parrot is ever guaranteed to talk, and a bird should not be purchased for its talking ability alone. These mini macaws are little escape artists, which stems from their curious and sometimes naughty personality. Steps should be taken to provide a cage that is safe and secure. All in all, the yellow-collared macaw is a lively, engaging bird that can make an extraordinary companion for the right owner. Given the right amount of training, discipline, and love, these birds can become loyal and affectionate pets that form deep and long-lasting bonds with their owners. If you are interested in a macaw or any type of parrot, don't overlook this species in favor of a larger or more colorful bird. They're readily available in the pet trade and should be pretty easy to find. Visit a few birds and, once you interact with a yellow-collared macaw, you will see that these little beauties can be larger than life! Although the range of wild yellow-collared macaws is relatively small, it includes several different countries. This provides the birds with a great variety of local fruits, nuts, seeds, and vegetation to eat. A pet yellow-collared should be fed a diet that is just as varied. Offer your bird a high quality extruded pellet, as well as fresh fruits and vegetables daily. Supplement that with seeds and nuts to keep him healthy and happy. Fresh water to drink should always be available. Yellow-collared macaws live to play and they need a roomy cage that seems too big for their small size. It's also important that they're allowed adequate time out of the cage to maintain their physical and mental health. Make sure that your macaw gets a minimum of one to two hours of playtime outside of the cage each day to let him stretch and exercise his legs, beak, and wings. This is also an opportune time to work on training, whether it be talking or fun bird tricks. They love to clown around and you'll have lots of fun bringing out this part of their personality. When outside the cage, a sturdy play stand with a place for treats and toys is essential for these playful little acrobats. It will become their home away from home and ensures they get to remain part of the household action. Parrots tend to do better with positive reinforcement, so remember to ignore bad behavior and reward good. When your macaw gets a little unruly out of the cage, sometimes all it takes to correct the behavior is to place him back on his perch. With a little patience, he'll learn what will keep you happy, which is all he really wants. Good parrot toys should be tough and plentiful in and out of the cage. The yellow-collared macaw needs to stay busy, so the more bird-safe toys you can give your bird, the happier he'll be. Wood, leather, and rope are great materials and be sure to have backups available so you can replace worn toys. Another essential is a dish of water for a bird bath. These macaws are delighted with water and will splash around to their heart's content if given the chance.